I stage with empty liquor bottles or bottles filled with water. 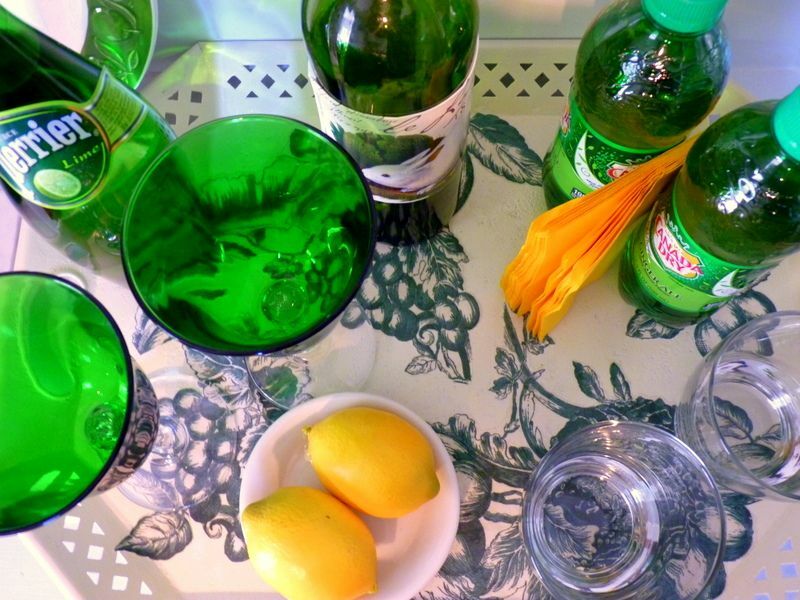 One prop that’s indispensable to home staging is the simple tray. It corrals little things and adds a subtle layer to tabletop decorating. Whether it's round or square, flat or with a curvy lip, vintage or brand new, wood or rattan, a tray can make a bunch of ordinary stuff look important and planned. It's an automatic de-clutterer. 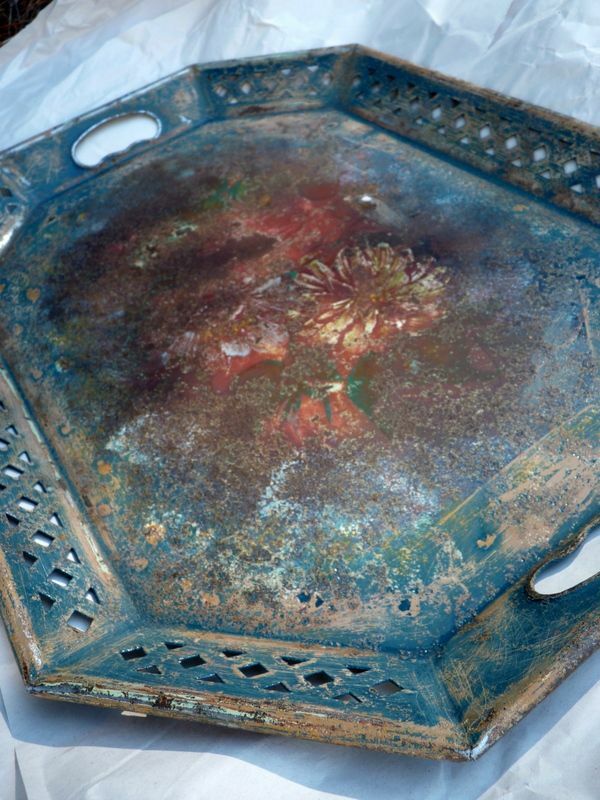 I decided to makeover a derelict metal tray I’ve owned forever. It would be perfect for autumn entertaining or staging in any room -- if only it looked presentable. This fall I’m taking a stand against the usual Halloween colors. I’ve centered my fall decorating around greens. I hunted through my fabrics to see what I had that was both green and harvest-reminiscent. 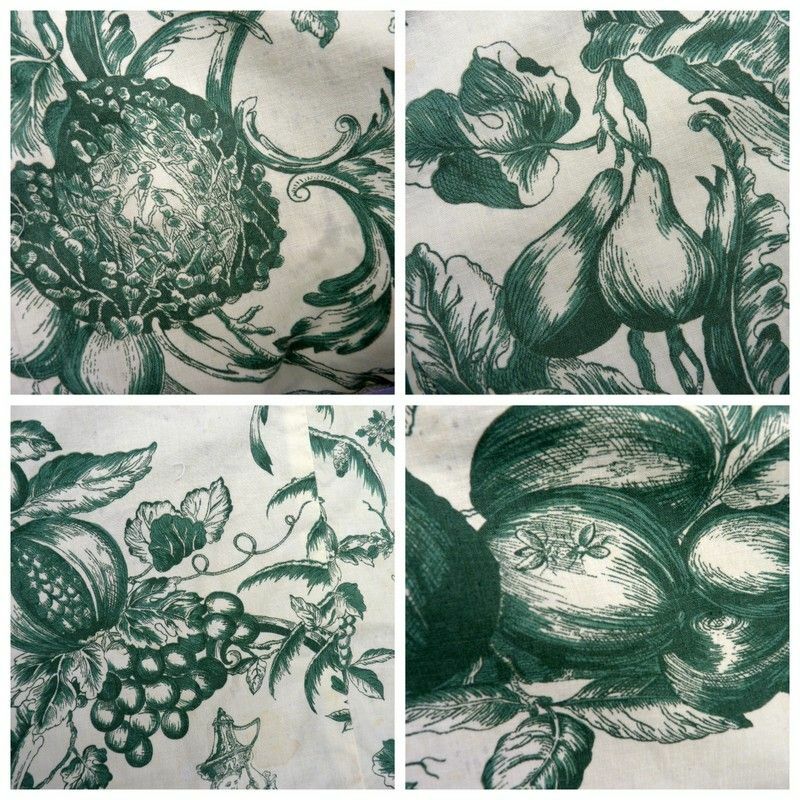 Bingo – a green and cream joie de vivre print that included fruit and vegetable images. The fabric lived a previous life as a DIY shower curtain from a house I staged eight years ago. My first step was to cut out only the images I wanted. I didn’t want ladies and gents dancing in their fancy clothes. I didn’t want the scrolls and birds and flowers. I wanted fruits and vegetables! Knowing I had enough of the fabric scraps to make a collage, I then sanded and primed the tray. I used an orbital sander for most of it, but an orbital doesn’t get into corners, so I hand sanded those areas. It’s not perfect, and it still has a hole in the bottom, but good enough! What I started with: the tray and the fabric. and stylish with a black base coat decorated with hand-painted flowers. These are the images I liked best in the fabric I was re-purposing. I thought they looked like traditional fruits of autumn. corrosion and old paint. Many of you would like it to stay this way. But I think it's a bit too shabby for home staging. didn't bother me. I knew it could be covered with a fabric scrap. I sprayed a couple of coats of cream colored Rustoleum paint that matched the fabric background. Then I trimmed the fabric scraps and arranged them to fill the tray. Once I thought the arrangement looked okay, I used spray adhesive to anchor them, making sure the edges were glued down well. the arrangement until I liked it, overlapping some of the fabric pieces. The next step was to finish the tray with a few coats of clear gloss spray to protect it. 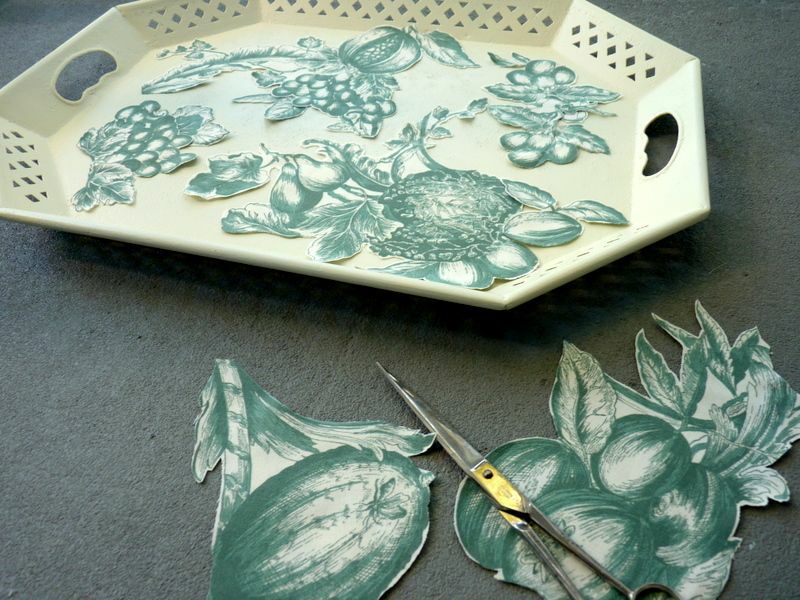 Any time you want to make custom props like vases, lamp shades, trays, artwork or other decorative accessories, pasting paper or fabric onto a surface and then clear-coating is a method you can count on. It’s easy and it’s cheap. 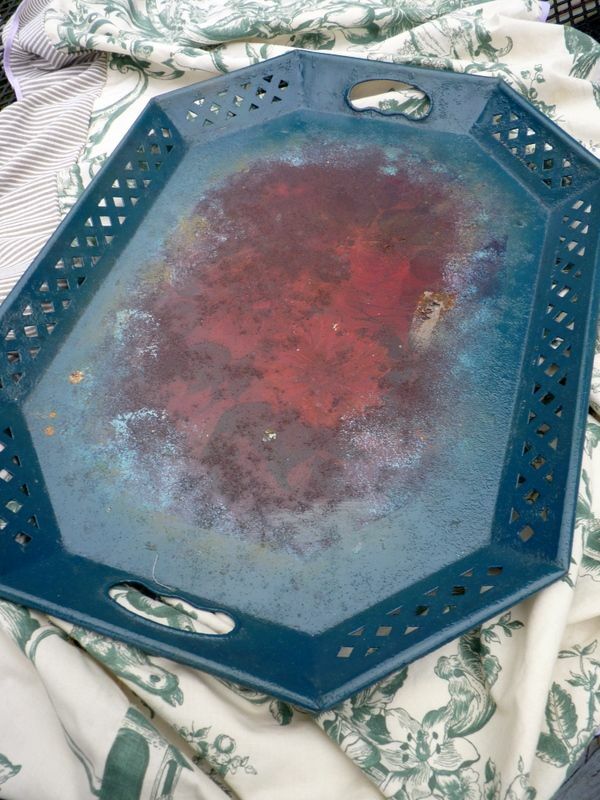 The clear spray is especially stinky, so I suggest you give a tray a few days to out-gas solvents before serving guests drinks or staging your foyer console with it. 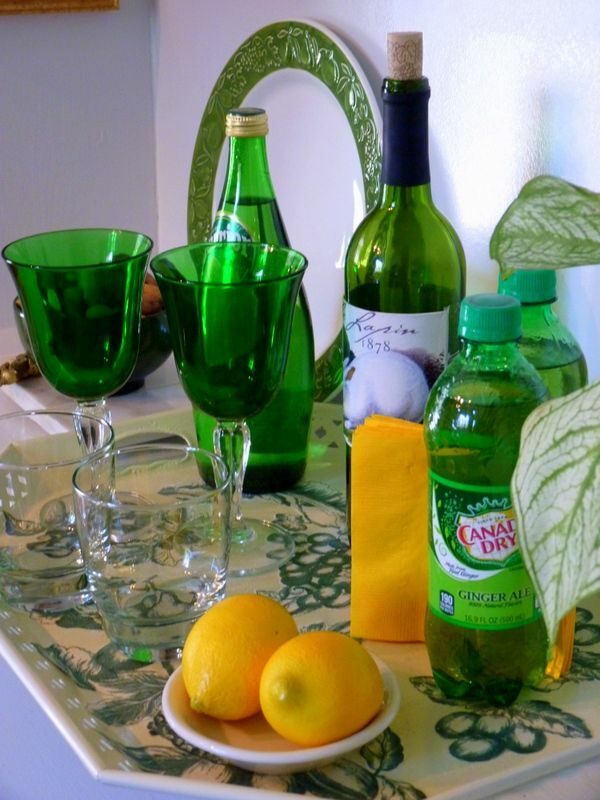 a dry bar or small beverage station in a living or dining room, or on a porch. 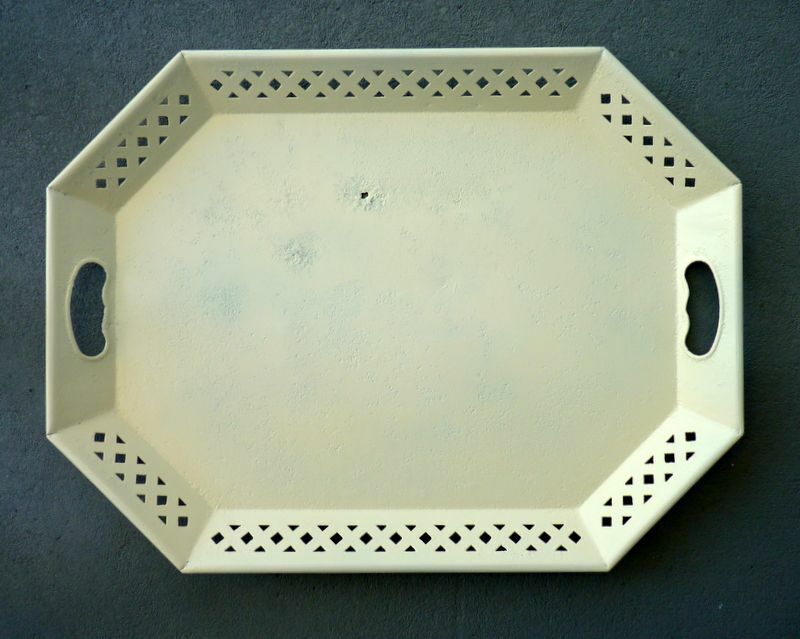 When it comes to trays, a gal can’t have too many, especially if she is staging a home. Want more ideas and inspiration for staging your home? Just download my $4.99 eBook, DIY Home Staging Tips to Sell Your Home Fast and for Top Dollar. Don’t stage alone, when I can hold your hand and make your home staging easier and more effective.